A new student Residence Hall known as East Village III, (Fleming Hall) continues the relocation of student residence halls toward the East side of the Campus consistent with the Master Plan. The new facility is a replacement for the outdated Branham Residence Hall constructed in 1967, which will be demolished to make room for a new Science building on the Historic Quad. The new residence hall sits at the intersection of Haygood & West Hamill Streets, and is the third phase of new student housing at the East Village. The building forms an exterior courtyard facing the main campus that creates social gathering spaces for both active and passive recreation.The 52,000 sf three (3) story “L” shape building contains 106 traditional style room is in one, two and three bed configurations totaling 206 total beds, plus ground floor staff apartment. To encourage interaction among residents, the students share bathroom facilities with 35 other residents within each wing.The building offers several social spaces at a variety of scales to further promote student interaction. Each floor has two (2) study lounges, and two (2) laundry rooms, one in each wing. The first floor features a large lobby, living room, and lounge space. There is a Tech lounge and gym facility on the second floor overlooking the two level lobby and gathering space. The third floor has a large outdoor roof terrace with views to the Historic Quad, including direct access to an adjacent kitchen for social function. 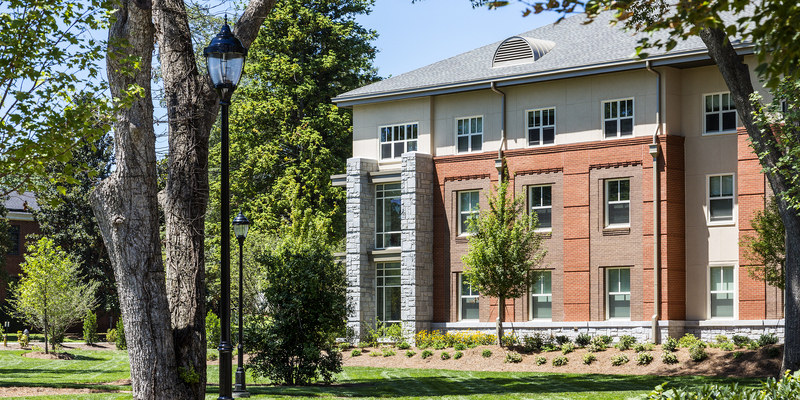 In keeping with the Emory tradition of sustainable lifestyles the building received LEED Silver Certification.